June 13 — St. Anthony of Padua, Priest and Doctor - Memorial - My Catholic Life! Saint Anthony of Padua is a famous Franciscan saint especially honored at an impressive shrine in Padua, in northern Italy. But he was not born as Anthony, was an Augustinian priest first, and was from Lisbon, Portugal, not Italy. St. Anthony, along with Saint Bonaventure, another early Franciscan, lent theological heft to the somewhat esoteric movement founded by Saint Francis of Assisi. Saint Francis was uniquely sensitive and eccentric, unsuited to leadership and vexed by the need to exercise authority. It was Saints Antony and Bonaventure who gave the Franciscan Order credibility, who anchored it in sound theology, and who assured its continued growth. Today’s saint was baptized Fernando and grew up in a privileged environment in Lisbon. He received a superior education and entered the Augustinian Order as an adolescent. While living in the city of Coimbra he met some Franciscan brothers who had established a poor hermitage outside of the city named in honor of St. Anthony of the Desert. Young Fr. Fernando was very attracted to their simple way of life. From these friars he also heard about the martyrdom of five Franciscan brothers at the hands of Muslims in North Africa. These martyrs’ bodies were ransomed and returned for burial in Fr. Fernando’s own abbey in Coimbra. Their deaths and burials were a life changing moment. The Augustinian Fr. Fernando asked, and received, permission to join the Franciscans and then adopted a new name – Anthony – taken from the patron saint of the hermitage where he had first come to know the Franciscans. The newly christened Fr. Anthony then set out to emulate his martyr heros. He sailed for North Africa to die for the faith or to ransom himself for Muslim captives. But it was not to be. He became gravely ill and, on the return voyage his ship was providentially blown off course to Sicily. From there he made his way to central Italy, where his education, mastery of Scripture, compelling preaching skills, and holiness brought him deserving renown. The great Saint Francis himself soon came to know Saint Anthony. Saint Francis had been skeptical of learning in general, even prohibiting his followers who were illiterate from learning how to read. He feared they would become too prideful and abandon the radical simplicity and poverty he wanted all Franciscans to embrace. Saint Francis only reluctantly, several years after founding his Order, allowed some of his brothers to be ordained priests. He had originally relied exclusively on diocesan priests to minister to his brothers and distrusted any of his followers who aspired to the honor of the Priesthood. In time, Saint Anthony became a famous preacher and teacher to Franciscan communities in northern Italy and southern France. His knowledge of Scripture was so formidable that Pope Gregory IX titled him the “Ark of the Testament.” In his Shrine in Padua a reliquary even holds his tongue and larynx for veneration. These organs had not disintegrated even long after the rest of his body had returned to dust. 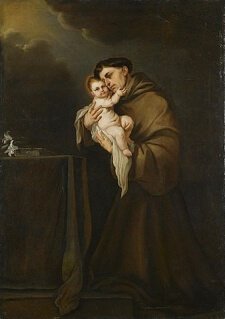 Saint Anthony is most often shown either with the child Jesus in his arms, holding a book, with a lily, or with all three. His intercession is invoked throughout the world for the recovery of lost items and for assistance in finding a spouse. St. Anthony of Padua, we seek your powerful intercession to have the right words on our lips to inspire the faithful and to correct and guide the ignorant. Through your example may our words also be buttressed by our powerful witness to Christ. IN 1221 St. Francis held a general chapter at Assisi; when the others dispersed, there lingered behind, unknown and neglected, a poor Portuguese friar, resolved to ask for and to refuse nothing. Nine months later, Fra Antonio rose under obedience to preach to the religious assembled at Forli, when, as the discourse proceeded, “the Hammer of Heretics,” “the Ark of the Testament,” “the eldest son of St. Francis,” stood revealed in all his sanctity, learning, and eloquence before his rapt and astonished brethren. Devoted from earliest youth to prayer and study among the Canons Regular, Ferdinand de Bulloens, as his name was in the world, had been stirred, by the spirit and example of the first five Franciscan martyrs, to put on their habit and preach the Faith to the Moors in Africa. Denied a martyr’s palm, and enfeebled by sickness, at the age of twenty-seven he was taking silent but merciless revenge upon himself in the humblest offices of his community. From this obscurity he was now called forth, and for nine years France, Italy, and Sicily heard his voice, saw his miracles, and men’s hearts turned to God. One night, when St. Antony was staying with a friend in the city of Padua, his host saw brilliant rays streaming under the door of the Saint’s room, and on looking through the keyhole he beheld a little Child of marvellous beauty standing upon a book which lay open upon the table, and clinging with both arms round Antony’s neck. With an ineffable sweetness he watched the tender caresses of the Saint and his wondrous Visitor. At last the Child vanished, and Fra Antonio, opening the door, charged his friend, by the love of Him Whom he had seen, to “tell the vision to no man” as long as he was alive. Suddenly, in 1231, our Saint’s brief apostolate was closed, and the voices of children were heard crying along the streets of Padua, “Our father, St. Antony, is dead.” The following year, the church-bells of Lisbon rang without ringers, while at Rome one of its sons was inscribed among the Saints of God. Reflection.— Let us love to pray and labor unseen, and cherish in the secret of our hearts the graces of God and the growth of our immortal souls. Like St. Antony, let us attend to this, and leave the rest to God.